Of the water that covers about 70% of the earth’s surface, less than 1% is available for human use, with the rest being either saltwater, frozen in polar ice caps or too inaccessible. Thus, while the demand for fresh water steadily increases, the supply will always remain constant because even though the water cycle returns water to the earth, it is not always returned to the same place, or in the same quantity or quality, especially as the effects of global warming continues to change both the quantities and distribution patterns of the water cycle. Across the globe, water consumption has tripled in the last half century and as the demand from personal, agricultural and industrial uses continues to rise, many regions around the globe, including Canada, are feeling the pressure. Furthermore, additional demands will come on top of the current demands as ancient aquifers that can take centuries to recharge, continue to be rapidly drained to meet current needs. Exterior water use varies greatly from region to region with water withdrawals for irrigation and landscaping being highest in drier regions which are often also the highest growth areas. Therefore, converting to a water-efficient landscape through the proper choice of plants and careful design can reduce outdoor water use by 20 to 50%. Also, recognizing that many people water their gardens too long and too often, and as a result risk over-saturating their plants, there is a great deal of room to realize reductions through proper education about the benefits of watering only if necessary. Even greater reductions are possible if xeriscaping gardening principles are used whereby little or no watering is required beyond the initial establishment period. Conventional wastewater systems use large volumes of potable water to transport wastewater to treatment facilities. Potable water, which we can use for drinking, cooking and bathing, among other uses, must meet a high level of purity and safety. Non-potable water is less pure but, when handled properly, it can be fine for landscape irrigation, makeup (replacement) water for cooling towers and toilet flushing. If we can provide separate plumbing in and around buildings for potable and non-potable water, it opens up significant new options for water supply. Installing separate supply piping for landscape irrigation and cooling tower makeup water and installing separate non-potable supply plumbing for toilet flushing are examples of water supplies that can replace the use of potable water. Water harvesting: Roof stormwater and snowmelt is directed to an underground storage tank to provide non-potable water for flushing. 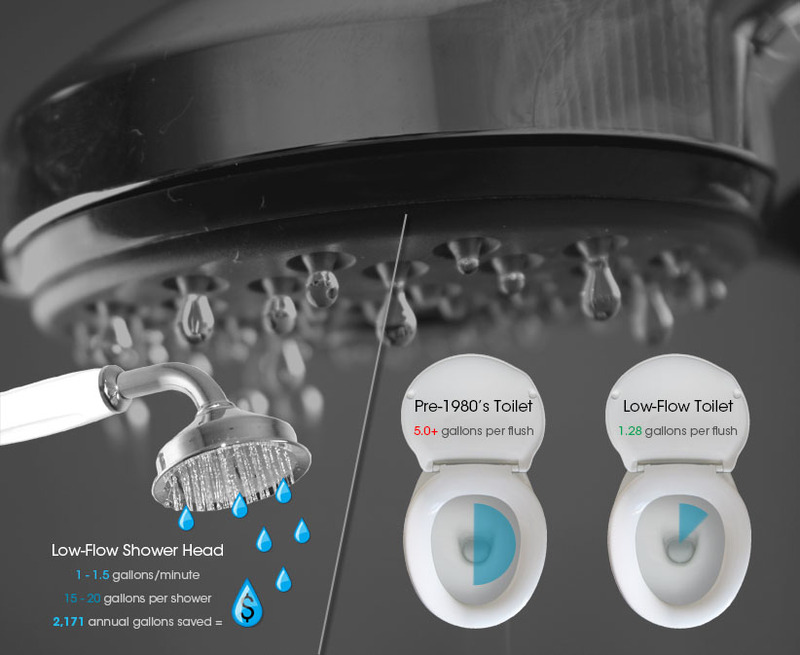 The average North American household spends over $700/year for water and sewage conveyance. However, evidence shows that by using just a few simple techniques, savings of up to 28% on a household water bill are possible.